Yes, I love the deals, but there is so much more to Black Friday then saving a few dollars! These days you really don't have to get in line and battle crowds to get the latest and the greatest at the lowest price. With a click of a mouse you can order everything online for the same price and companies often offer free shipping. Obviously, there is more to Black Friday then just the deals. Tonight I stood in line for 1 1/2 hours waiting to get into a store. It was freezing - not technically, but 40 degrees is not warm especially when it is windy, but I was prepared in my winter coat, Ryan's fur, obnoxiously warm and goofy looking hat, gloves, wool mittens over the gloves, a scarf, and a blanket wrapped around my legs which were layered with long underware and jeans! My nose and toes were cold, but otherwise I was fine. The time I waited in line actually went by very quickly. 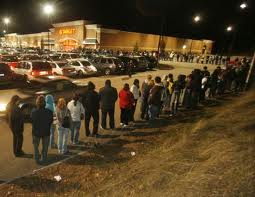 One of my favorite parts about Black Friday is standing in line! I know it sounds ridiculous! I get to talk to strangers and bond over the oddest things! During our brief time together we forge partnerships and look out for one another. Cutters will not be tolerated and my new friends will have my back! We will look at the people who obviously have no idea they live in Michigan as they freeze in short sleeve shirts, mini skirts, and high heels and shake our heads wondering when they were dropped on their heads. (Seriously! How stupid are you people???) We will save a place in line for someone we have never met while they make a coffee run for everyone around them. We will tell stories about our lives and share experiences. Once we are out of line, however, we may never see each other again, but that is ok because for a brief time the girl in the Eddie Bauer sweatshirt, the super skinny girl, the girl who spilled coffee on her leg, and the girl who yelled "No cutters!" every few minutes were all my BFFs in every sense of the word. We shared something really special in that line! Shopping online may only take a few clicks and a few minutes, but then I would have missed out on the entire experience of it all! There is no fun in that! 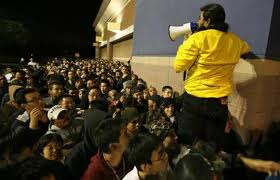 And don't tell me that you Black Friday shoppers out there don't like the crowds, chaos, and challenge of it all! You have to like or you wouldn't be out there! Bask in the glow of those sale lights and hum to the rhythm of the crowds - 'tis the season and there is nothing like it!! Have fun!